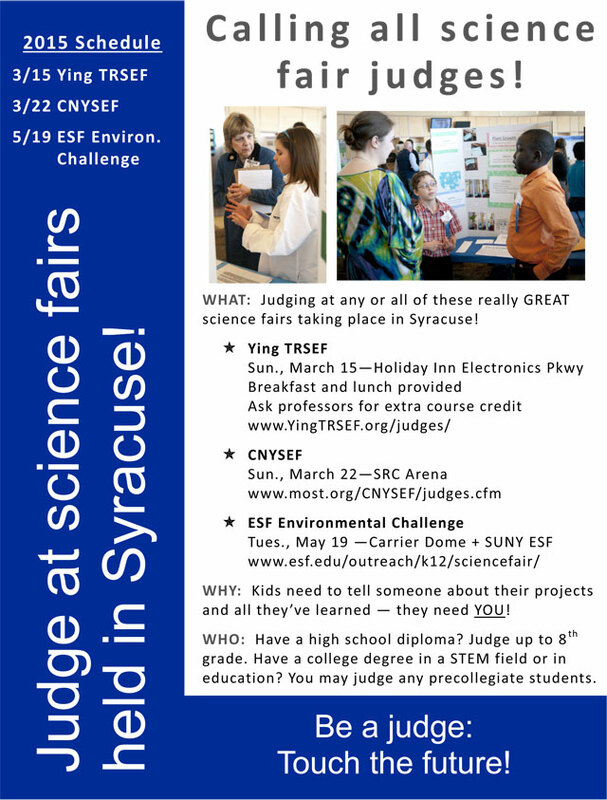 Two requests for judging have come across my inbox from TACNY for the Ying Tri Region Science and Engineering Fair (TRSEF) on Sunday, March 15th and the Central New York Science And Engineering Fair (PDF Link) on Sunday, March 22th. I am volunteering for both events and encourage others with any science inclination to see just how smart some of our CNY youths are. 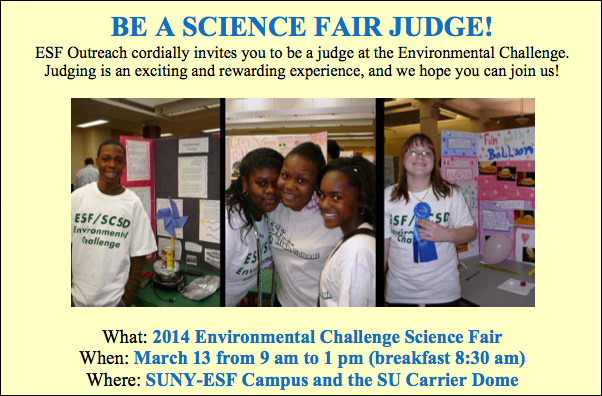 Volunteers are needed this year to judge projects at the Central New York Science and Engineering Fair on Sunday, March 22, 2015 at the SRC Arena. Students from Cayuga, Cortland, Madison, Onondaga and Oswego counties will compete in two divisions, the junior fair for 4th-8th graders and the senior fair for 9th-12th graders. Judges don’t need to be experts in science to listen as the students demonstrate how much they have learned and accomplished. A continental breakfast, lunch and training will be provided for the judges and volunteers. Those interested in serving as judges or volunteers can apply online here. If you have registered with the MOST online in the past, you do not have to register again. Send an e-mail to volunteer@most.org or call (315) 425-9068 x2145 indicating what fair assignment you would like (junior judge, senior judge, special awards judge, volunteer). For more information, contact the CNYSEF Director at CNYSEF@most.org. Please pass this request on to your colleagues. The encouragement and interest shown by volunteers and judges is an essential part of the student’s science fair experience. Help inspire our future generation of engineers and scientists. The posted email below from Mary Eileen Wood of Ying-TRSEF and OCC (and CNY’s most active STEM educator!) is an announcement both for interested CNYO members and anyone else who might have a club, organization, or garage full of kid-friendly equipment who might want to set up a booth to participate in the Maker Hall festivities. This will be my 3rd such event (Ryan Goodson and I having run CNYO booths at the two events (announced HERE and HERE) in 2014) and I can tell you that these Maker Faires are THE place to be for anyone interested in (and interested in promoting) STEM education. For the first time, the MLK Committee is incorporating a Maker Hall into the Dr. King Celebration, giving the STEM community the Fowler High School gymnasium. TACNY members can once again delight a diverse array of families from our community with science and technology! Wonder what a Maker Hall is? It’s basically a Mini Maker Faire – lots of stations with fascinating hands-on activities for all ages that engage families in exploring great Science, Technology, Engineering and Mathematics fun. The adventures already include the IEEE station with flashing circuits, the NASA Solar Ambassador’s space rocks, OCC’s “virtual engineering” center, the U.S. Army team’s hands-on gear set up, DIY spaghetti engineering, Rotary’s basketball math … and whatever YOU would like to bring! * Register ASAP to volunteer for the Maker Hall – we are preparing for 500 attendees! * Our Hall’s volunteer shift is 10a-3p, so you will be provided with a free lunch! * This link gives you the flyer (PDF) for recruiting more volunteers. * This link is the invitation (PDF) to attend the Dr. King Community Celebration. Send it to everyone you can, so we have LOTS of people at this great STEM party! * Questions? Call Mary Eileen Wood at 315-468-1025 or email trsef@verizon.net. * Plan to dress comfortably and have a GREAT time! Three Local Science Fair Judging Opportunities In March: Science-y Adults Please Take Note! Greetings fellow astrophiles (and other readers)! March is increasingly looking like a very busy month for CNY science. On top of CNYO’s Liverpool Public Library Session on the 6th, upcoming Sidewalk Astronomy event on 8th, and the Regulus Occultation on the 20th, March also sees three big Science Fairs being hosted on the SU and OCC campuses (with some CNYO participants set to act as judges again this year). If you’re a science-inclined adult, please consider participating as a judge for one or more of these events. While some of the categories at each event may require/prefer people in the sciences with Bachelors or advanced degrees for judging, many do not. Your interest in what the kids… er… researchers are doing is plenty for being able to support the efforts of these three science fairs. Ryan Goodson and I participated in the Ying Tri Region Science & Engineering Fair last year and had an excellent time touring the projects and talking shop with many of the presenters. Of specific note for you astronomy buffs was the presentation shown below by Tyler Mucci, featuring a dual optic design for a telescope that lets two people observe the same object simultaneously. Better still, he brought the fully-functional prototype with him (and the results of his optics testing. We should have flown Bob Piekiel in from Marcellus for advanced topics). 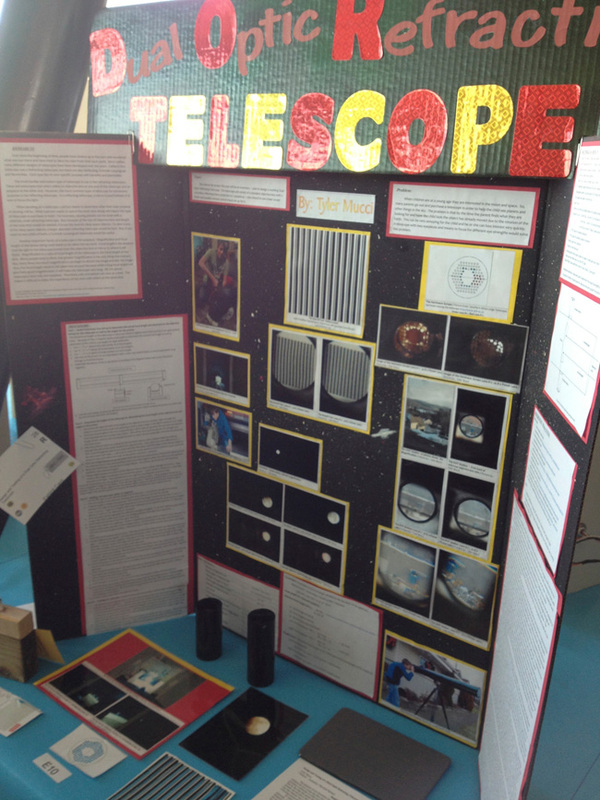 You never know what to expect at a science fair (such as Tyler Mucci’s presentation above from the 2013 YingTRSEF event last March), but you’ll definitely be impressed. The three upcoming science fairs are listed below with links to their home and registration pages. The event info can be found at www.most.org/cnysef/. Onondaga Community College is once again hosting the Dr. Nelson Ying Tri Region Science and Engineering Fair the weekend of March 22 – 23. This two-day science fest celebrates student interest in the STEM fields of science, technology, engineering and mathematics, and promotes and nurtures hands-on experience in Science and Technology. 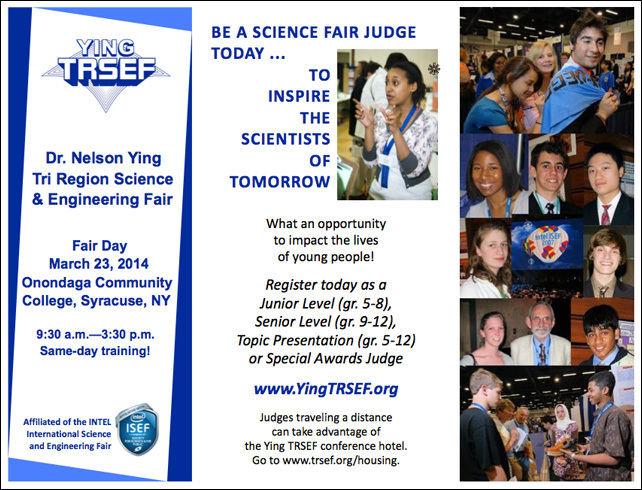 We’re inviting you to judge at the Ying TRSEF, interviewing students in either the Senior (Gr. 9-12) or Junior (Gr. 5-8) levels. Junior level judges only need a sincere interest in encouraging middle school students. In fact, we encourage college students in STEM fields to judge the younger students. For the Senior level, we are looking for judges with at least a bachelor degree in a STEM field or Education, who will interview students competing in their own area of expertise. This year, we are aiming for surpass last year’s record attendance! That means we need even more judges. JUDGES are the MOST IMPORTANT part of the Science Fair, because it is that personal contact with sincerely interested adults that encourages students. Student feedback consistently rates judging at the core of their fair experience. The commitment? Only a few hours on March 23rd, from 9:30 a.m. to 3:30 p.m., at the latest (and we feed you really well). Please fill out an online application at www.YingTRSEF.org/judges/. The Ying TRSEF website also has details about the Fair, judging, and pictures from earlier Ying TRSEF fairs. Please forward this message to anyone you think might be interested in judging. For this you can think “distribute widely.” And, of course, feel free to contact me with questions. What is the Environmental Challenge? The Environmental Challenge is a science fair and career exploration opportunity designed especially for all Syracuse City School District 7th and 8th grade students. 500 student participants are expected! Judging is EASY and FUN, and we are looking for at least 100 judges. No experience is necessary. Join us in the new ESF Gateway Center at 8:30 am for breakfast and a chance to mingle with other judges. A brief orientation will follow promptly at 9 am in Gateway. Each judge will be assigned to assess the projects of a group of students. As a judge you don’t only get breakfast and lunch, but the opportunity to influence the lives of the young student participants! The encouragement and interest shown by volunteer judges is an essential part of the Environmental Challenge experience. How do I sign up? Questions? Volunteers are needed to judge projects at the Central New York Science and Engineering Fair to be held on Sunday, March 30, 2014 at the SRC Arena. Students from Cayuga, Cortland, Madison, Onondaga and Oswego counties will compete in two divisions, the junior fair for 4th-8th graders and the senior fair for 9th-12th graders. Judges don’t need to be experts in science to listen as the students demonstrate how much they have learned and accomplished. A continental breakfast, lunch and training will be provided for the judges and volunteers. Those interested in serving as judges or volunteers can apply online here. If you have registered with the MOST online in the past, you do not have to register again. Send an e-mail to volunteer@most.org or call (315) 425-9069 x2141 indicating what fair assignment you would like (junior judge, senior judge, special awards judge, volunteer). For more information, contact me or the CNYSEF Director at CNYSEF@most.org.